This stunning mosaic design in small, colourful vitreous glass mosaic tiles is supplied as Mosaic Tile Art, hand made in the UK. Home Studio crafted onto fibreglass mesh sheets ready for tiling and grouting, this Limited Edition mosaic will brighten up walls and floors, indoors or outdoors. It is made from 40,755 tiles in 45 colours, with a nominal size of 2146mm wide x 2300mm high (approx 84 x 91 inches). Although this shop is for UK customers only, this mosaic design can be shipped to Europe, USA, Canada, Australia and other countries - order online at Mr and Mrs Andrews (Gainsborough) on Kaamar.com (or if you prefer, use the quote button on the right to ask for a quote). This mosaic design is sized close to full height for most walls, to make a stunning wall mural. 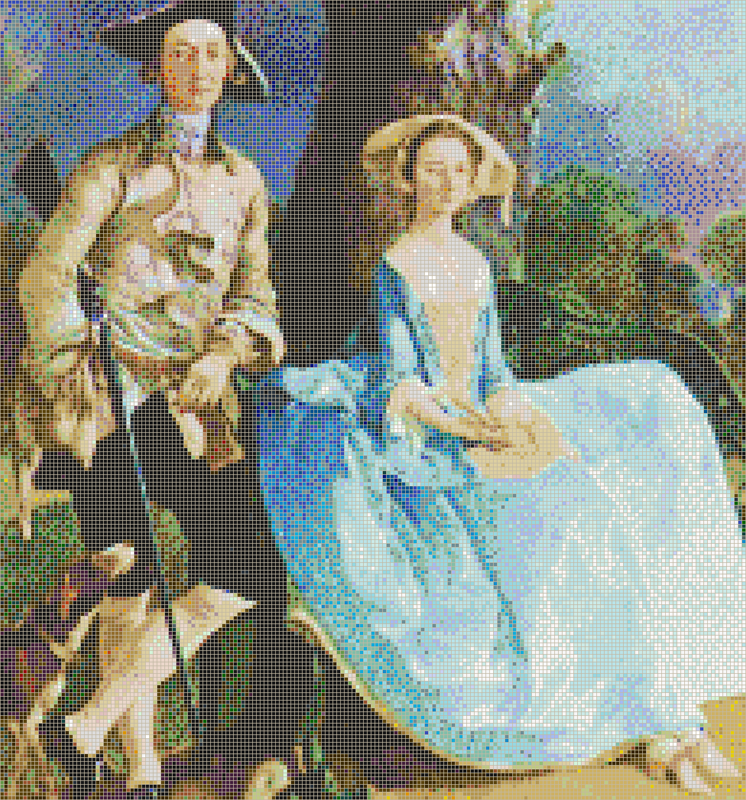 This mosaic design is Copyright © 2011 Kaamar Ltd, based on an original painting "Mr and Mrs Andrews" by Thomas Gainsborough (1727-1788) under Public Domain licence. Inset as a picture, or made larger to cover whole wall. No of Tiles: 40,755 tiles (195 wide x 209 high) in 45 colours. Mosaic Size: 2146mm x 2300mm nominal (approx 84 x 91 inches). Mosaic Area: 4.936 square metres nominal. Sheet Size: 318mm x 318mm (841 tiles/sheet) nominal. No of Sheets: 42 full sheets, 14 partial sheets. Grout Colour: Grout not supplied, you can choose colour - design shows Light-Medium Grey ("Manhattan Grey"). 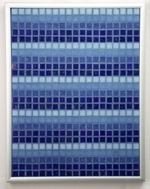 Our "Mosaic Tile Art" is prepared using the "Reverse Double Direct" method, a variation of the "Double Indirect" method, where tiles are first laid out in the design and attached by their top face to a removable transparent film, which is labelled to show the orientation and the position of the tile sheet in the mosaic design. A permanent high strength mesh is then applied, as an extra security holding the design together in transit, using waterproof adhesive to the underside of the tiles. The sheets can then be pressed, mesh down, into the tile adhesive, transferring chunks of the design in one go, maintaining the tile layout. Once the tile adhesive is set, the transparent film sheets can be easily peeled from the tiles. With the film removed, the tiles can now be grouted to complete the mosaic. This mosaic design is also available in custom sizes (bigger=more detail), showing other grout colours and delivery options - see Mr and Mrs Andrews (Gainsborough) on Kaamar.com (our international site with advanced mosaic design features). The mosaic is supplied pre-prepared in sheet form. The tiles are attached to a strong fibreglass mesh with a waterproof adhesive to form a sheet. The whole sheet can be tiled in one go, including the mesh, similar to traditional single colour mosaic tile sheets. Unlike single colour sheets, there is also a transparent film sheet applied to the top of the tiles. This maintains the tile arrangement in transit and during installation, and is labelled to show the position and orientation of the sheet within the mosaic design. After the tiles have been fixed, this film can be easily peeled off, before grouting to finish. Ready for self tiling, or by your local tiler. Leave the transparent film on while laying the sheets, mesh side first, into the tile adhesive on your levelled wall/floor. Once the adhesive has set, peel off the film, then grout as usual. Installed size can be affected by installation and other factors, so allow a typical ± 1% tolerance. Note: the thickness of these tiles at 3-4mm may be less than any surrounding tiles, so giving a recessed effect to your picture. This can be avoided by skimming with tile adhesive and allowing to set, which is also recommended to level the surface. A good quality White, flexible, waterproof tile adhesive, suitable for small vitreous glass tiles is recommended. Grout should be suitable for small grout lines between vitreous glass tiles, anti-mould, waterproof and flexible, in the colour of your choice. Light-medium grey is most common, providing a neutral background for tiles of many colours, however there are a wide range of colour grouts available. The grout colour can be chosen to lighten or darken the overall mosaic, to contrast or colourise the tone of the mosaic. We can provide representations of your mosaic with other grout colours. Floor installation (pedestrian areas only) requires more careful substrate preparation and the use of suitable adhesives and grouts. Despite the durability of the glass tiles, floor mosaics in areas of excessively heavy traffic, such as public entrances to offices, will be subject to wear and will require increased maintenance. We can supply a full spares pack with your mosaic, including agreed numbers of spare tiles of each colour and a detailed design plan for repairs. We can advise on, or even supply, recommended tile adhesives and grouts. We can also supply matching tile sheets of single colour tiles for the surrounding areas around your mosaic. Tile mounting to mesh and film backings are carried out by hand, inevitably resulting in minor variations in tile positions, orientation, alignment etc. For delivery to other countries, to the rest of the UK including excluded remote areas or if you require additional delivery options such as Saturday/Next Day/Before 10am/Collect please order online at Mr and Mrs Andrews (Gainsborough) on Kaamar.com.